Filter by gauge Show all gauges 14g 8g 6g 4g 00g/10mm 7/16" 12mm 9/16" 5/8" 18mm 3/4" 20mm 7/8" 15/16" 1"
Sizes offered: 14g, 12g, 10g, 8g, 6g, 4g, 2g, 1g, 0g, 00g/9mm, 00g/10mm, 7/16", 12mm, 1/2", 9/16", 15mm, 5/8", 18mm, 3/4", 20mm, 7/8", 15/16", 1"
Whether you're looking to stretch up a few sizes or just one, these stretching plugs will meet your need. They are affordable, basic, and have between sizes. 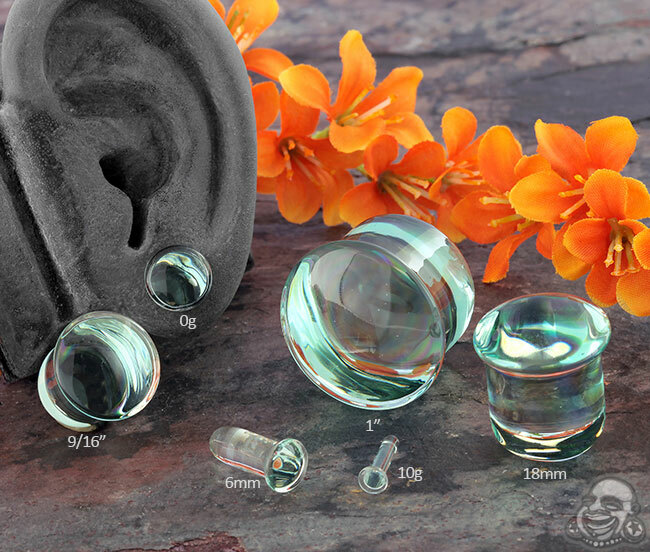 Stretch to your goal size comfortably with these clear glass plugs. Conveniently available in a variety of in-between sizes, the rounded single flare end makes stretching up easy and safe. Buy a single size, or save some money and buy a stretching kit composed of multiple pairs of plugs. 11/16" and higher have an overall length of 7/8"
If you're interested in getting a little more knowledge on how to safely stretch your ears- read this blog post! In addition, these glass plugs are autoclave safe giving buyers the option of making them completely sterile before stretching. An autoclave service is selectable at checkout.